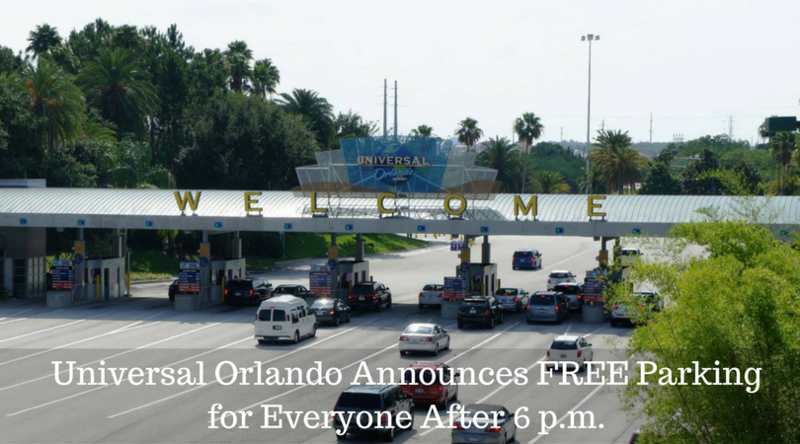 Home Attractions Universal Orlando Announces FREE Parking for Everyone After 6 p.m.
Universal Orlando is dropping the fee for its parking garages for all visitors who arrive after 6 p.m., the resort announced Wednesday. This convenient little benefit was previously exclusive only to Florida residents with valid proof of residency. Now, tourists get to enjoy the free evening parking as well, a small win after Universal increased its annual passholder prices by about $50 last year. The dual garages, which hold 18,000 vehicles, provide parking for visitors going to Universal Studios and Islands of Adventure theme parks and the Universal CityWalk entertainment district. Universal CityWalk stores and restaurants open from 11 a.m., and some nighttime locations close as late as 2 a.m. The nightlife-driven destination doesn’t require a ticket to visit the variety of dining options, including the new Toothsome Chocolate Emporiums & Savory Feast Kitchen, Hard Rock Café and Jimmy Buffett’s Margaritaville. CityWalk also has a movie theater, mini-golf course, and on certain dates, live entertainment. Islands of Adventure and Universal close as early as 6 p.m. on some days and as late at 10 p.m. a few days of the month. Universal is set to open their latest addition, Volcano Bay, a water theme park, on May 25. The new park’s hours have not been announced yet. Of course, as mentioned in the tweet, the deal will not include Halloween Horror Nights come the fall. BREAKING: Pandora– The World Of Avatar Opening Date Announced!